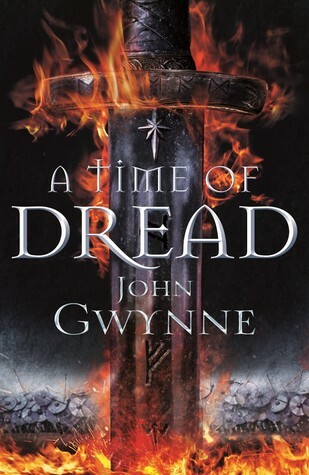 John Gwynne’s new book A Time of Dread has just been released and we are honoured at having been chosen to take part in the book tour for this highly anticipated new story. Also, honoured might be a slight understatement. We are ECSTATIC! There are dates below listing all of the blog stops for those who want to follow along. All of these blogs including ourselves appreciate your support! Next up is a little preview – an extract from A Time of Dread. The extract contains a few elements from the last events of Wrath (final book of the Faithful and the Fallen)! The review is spoiler-free! continued to hack remorselessly at the iron-hard ground. pickaxe, grabbing his spear and pointing it upwards. a mess of iron-grey hair. and picking up the axe again. ‘It’s deep enough to hold any elk I’ve ever seen,’ Olin said. Drem had been digging pits since he was ten summers old. sent a shiver up his arm. ‘Sounds like you’ve found the mountain’s root,’ Olin said. muscle lean and knotted as old roots. Drem turned and looked at his handiwork. river there soft and marshy. Drem smiled at his father’s praise. their camp, the river foaming white alongside them. hare spitting and sizzling as it dripped into the flames. and now they were almost home. Lands,’ his da had told him when they’d forged it together. loved it, that it felt a part of him, his permanent companion. The bone-antler hilt was worn to a perfect fit for Drem’s fist. no torches or candles burning at a window. anywhere since Mam . . .
the northern bank of the lake. ‘That wasn’t there when we left,’ he said to his da, pointing. wasteland of rock and ash. His da grunted, licking fat from his fingers. war spilling into the world of flesh. ‘Much has changed since the coming of the Ben-Elim,’ Drem said. them, despite Drem’s attempts to lure him into that conversation. here, irrigating, farming, planting, growing. of night as darkness seeped into the world around them. very sound of their name. Because they’d slain his mam. able to talk of Drem’s mam, too . . .
‘Have you seen Drassil?’ he asked, a new tactic. Olin gave him a sidelong look. Drem opened his mouth to ask another question. furs and popping of a cork as a skin of mead was unstoppered. It is no secret that John Gwynne’s debut series, The Faithful & the Fallen, is one of my all time favourite reads. I regularly recommend it to anyone looking for a great read and I have marked him down as a permanent entry on my list of auto-buy authors. Therefore it should come as no surprise that I was MORE than excited to get an early chance of reading his latest book, A Time of Dread, the first book in the Of Blood and Bone trilogy. When John Gwynne announced this new series, I was both overjoyed at getting to visit this world and it’s characters again, but at the same time very worried. Starting any new series in the same world as an established series always strikes me as a highly precarious prospect. Comparisons are inevitable and having the task of writing characters that can hold up to the love you have for those who came before is not one I envy any author. Fortunate for Mr. Gwynne, he is a rock star when it comes to characterization and always writes memorable, fully rounded characters that you can easily love and hate, root for or against. As for the world that these characters are presented in – it is much the same and yet much changed from what we came to know in tFatF. Time changes everything, and it was very interesting to hear different views on how events from tFatF are believed to or said to have unfolded. As many a fantasy lover will know, world-building is the lifeblood of fantasy’s storytelling and in this case it is a resounding success, largely thanks to the groundwork the author has laid in tFatF and subsequently built on in AToD. He has gracefully and effortlessly managed to pen a new and exciting tale, whilst still grounding it in the familiar, rich and evocative history of the Banished Lands, giving fans of the the Faithful & the Fallen much to wax nostalgic about. While most of our heroes have passed on and taken their journey over the Bridge of Swords, there are still a few familiar faces to be seen among the new, and it was a joy reading about both the old and new even as the mentions of some of those absent characters occasionally invoked a strong sense of poignancy. Take a bow for making us care so much Mr Gwynne. This seamless interweaving of two different times is done so masterfully, that I am almost tempted to proclaim that reading the first series is unnecessary if you want to start with this book first. That would be a mistake of two parts though. Firstly, tFatF series is an awe-inspiring achievement in fantasy writing and should be read by EVERYONE. Plainly said, it’s THAT good. Secondly, whilst AToD is still a great read if it is your first John Gwynne book, the added benefit of having read the tFatF series elevates this book from great to absolutely brilliant! There are so many small details and mentions that just give everything occurring that extra little bit of magic, making it so much more fun. The pacing is juuuuuust perfect. It might still be early on in his career, but the author seems to have perfected the art of the slow reel, starting leisurely and pulling you in, building up the tension, before yanking you to the edge of your seat. While the early tone set for AToD feels much darker than the one of tFatF, themes of love, friendship, honour, family, and of course truth and courage are still ever present, and still form the foundation of this writing that has grown from strength to strength, book, by book. And the action… John Gwynne keeps on reminding us that he is second to none in the this department, whether it is large scale battles or mano a mano, his writing is so immersive and vivid that you cannot help but be transported to the scene of the violent, gory action. I more than once found myself ducking a sword or axe meant for a POV character. And the mentioned dread… it is at first a mere whisper of foreboding, fleeting, hinted at, creeping but ever present. Page after page though, this sense of unease slowly escalates as the story marches on to it’s pulse-pounding climax, relentless, never wavering. By the time the breathtaking closing sequences are done, the dread spoken of in the title is indeed a palpable, living thing that permeates the pages. You can almost feel it’s visceral grip on you as you close the book and fear what the future has in store for our protagonists. Grab the book hot of the press my friends – you cannot go wrong with this one! Thank you to John Gwynne & Pan Macmillan for giving me the opportunity to read this wonderful book in exchange for an honest review. You can follow John Gwynne on Twitter and Facebook and Pan Macmillan as well over here and here . PS: A very special mention for that breathtakingly gorgeous cover and bonus points for the Old Norse runes on the hilt that spell DREAD! So cool Mr Gwynne, so cool!